With the influx of parents, grandparents, and even great grandparents now using this globally popular social media site, many analysts were beginning to wonder if teens would see Facebook as something that’s passé. Especially since there are many different social networking sites that provide teens with an outlet to interact with others online, such as Twitter, Google+, Pinterest, and Instagram, there are some out there that may see Facebook as something that is no longer cool. Despite these varied opinions, it hasn’t had much of an impact on Facebook’s user base, since some new studies show that the social media giant is still a big hit with teens. Forrester Research, a global advisory firm, released an interesting study on June 24th. According to the results of this recently released study, more than 75% of U.S. youth continue to use Facebook at least once a month. Forrester’s North American Technographics Youth Survey was derived from the responses of 4,517 internet users, with their ages ranging from 12 to 17 years old. 28% of these users admitted to using Facebook “all the time,” which is a higher percentage than any other social network that’s out there. The results of an intriguing survey by Niche were published on their website. Seven thousand Class of 2014 students that use the review site were asked to rank 50 popular websites and apps, based on their frequency of use. The results of this survey showed that 87% of these teens still use Facebook, while 45% don’t even use Twitter. What do these studies show (besides the overall significance of social networking in modern times?) It’s easy to see that Facebook still reigns supreme, even with the influx of competitors that are out there. Though it’s been around since February 2004 (originally as thefacebook, which was only used by Harvard college students at the time,) it still has a huge impact on millions of people across the globe. Do you feel that Facebook is starting to lose some steam? Feel free to leave your comments below! 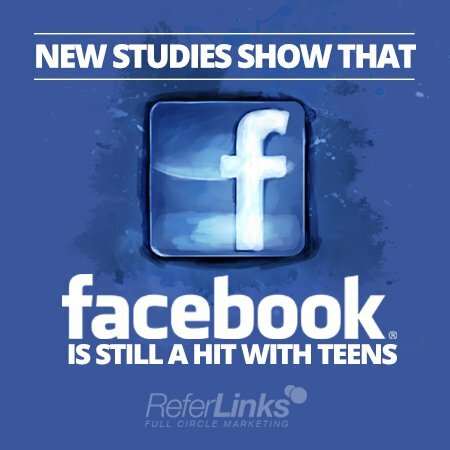 This entry was posted in Social Media and tagged Facebook,Facebook and Teens,Facebook Marketing,Facebook Studies,Marketing,Online Marketing,Social Media,Social Media Marketing on July 22, 2014 by ReferLinks Online Marketing.